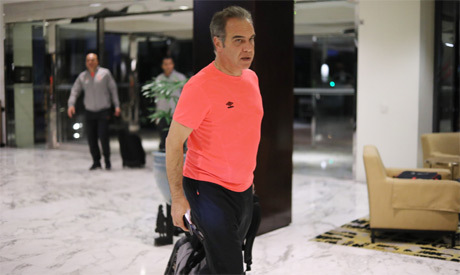 Ahly coach Martin Lasart attributed his side's poor form in a stunning 1-0 African Champions League loss to Simba on Tuesday to humidity and heat, saying he is confident the Cairo giants will eventually reach the quarters. The Red Devils were undone by a second-half goal from Meddie Kagere in Dar es Salaam to slump to their first group stage defeat of Africa's flagship club competition. Despite the loss, they remained on top of Group D with seven points, just one ahead of second-placed Simba. "We played in a very hot weather and insupportable humidity," Lasarte told the post-match news conference. "The bad weather especially in the second half affected the players who appeared very exhausted." "I played with three central midfielders to avoid fatigue." The Uruguayan coach also criticised Simba players for wasting time, stressing that their behavior is "completely far of fair play." "They deliberately kept tumbling to the ground 15 times to waste time," he added. The 57-year-old said he is confident that the record eight-time winners will reach the Champions League quarters and go far in the competition as they eye their first title since 2013. "Ahly always look forward. Our target is to win in our next two games and advance to the next round to achieve our ultimate target and win the trophy." Ahly will visit Congolese side Vita Club on 8 March before hosting JS Saoura of Algeria eight days later in their final group-stage game. They reached the final in the past two editions but failed to win the title after losing to Wydad de Casablanca and Esperance de Tunis respectively.